The Obama administration is forging ahead with its plan to refocus the war on drugs and reduce the size of the U.S. prison population. Last month, the U.S. Sentencing Commission proposed changing federal guidelines to reduce the average prison sentence for dealing drugs by a year, from 62 months to 51 months. On Thursday, Attorney General Eric Holder will testify before the commission to endorse the plan. “Certain types of cases result in too many Americans going to prison for far too long, and at times for no truly good public safety reason,” Holder plans to testify, according to an excerpt provided to the Washington Post. About half of the 215,000 inmates in the federal prison system are doing time for drug crimes, and the change would affect the suggested sentences for roughly 70 percent of drug offenders. The government estimates that under the new guidelines, the federal prison population would decrease by about 6,550 inmates in the next five years. If the commission votes to approve the plan, the revised guidelines judges must consider would go into effect in November. 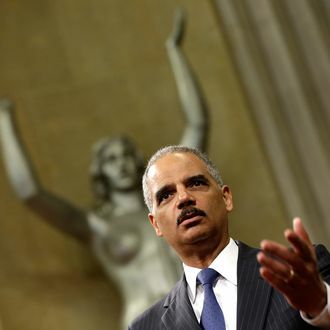 Until then, Holder will instruct prosecutors not to push judges for the longer sentences.